Infrared (IR) light is electromagnetic radiation with a wavelength between 0.7 and 300 micrometres, which equates to a frequency range between approximately 1 and 430 THz. IR wavelengths are longer than that of visible light, but shorter than that of terahertz radiation microwaves. Bright sunlight provides an irradiance of just over 1 kilowatt per square meter at sea level. Of this energy, 527 watts is infrared radiation, 445 watts is visible light, and 32 watts is ultraviolet radiation. Infrared light is even used to heat food sometimes - special lamps that emit thermal infrared waves are often used in fast food restaurants! Shorter, near infrared waves are not hot at all - in fact you cannot even feel them. These shorter wavelengths are the ones used by your TV's remote control. How can we "see" using the Infrared? Since the primary source of infrared radiation is heat or thermal radiation, any object which has a temperature radiates in the infrared. Even objects that we think of as being very cold, such as an ice cube, emit infrared. When an object is not quite hot enough to radiate visible light, it will emit most of its energy in the infrared. For example, hot charcoal may not give off light but it does emit infrared radiation which we feel as heat. The warmer the object, the more infrared radiation it emits. Humans, at normal body temperature, radiate most strongly in the infrared at a wavelength of about 10 microns. (A micron is the term commonly used in astronomy for a micrometer or one millionth of a meter.) This image ( which is courtesy of the Infrared Processing and Analysis Center at CalTech), shows a man holding up a lighted match! Which parts of this image do you think have the warmest temperature? How does the temperature of this man's glasses compare to the temperature of his hand? To make infrared pictures like the one above, we can use special cameras and film that detect differences in temperature, and then assign different brightness or false colors to them. This provides a picture that our eyes can interpret. The image at the left (courtesy of SE-IR Corporation, Goleta, CA) shows a cat in the infrared. The orange areas are the warmest and the white-blue areas are the coldest. This image gives us a different view of a familiar animal as well as information that we could not get from a visible light picture. Many things besides people and animals emit infrared light - the Earth, the Sun, and far away things like stars and galaxies do also! For a view from Earth orbit, whether we are looking out into space or down at Earth, we can use instruments on board satellites. Other satellites, like the Infrared Astronomy Satellite (IRAS) look up into space and measure the infrared light coming from things like large clouds of dust and gas, stars, and galaxies! 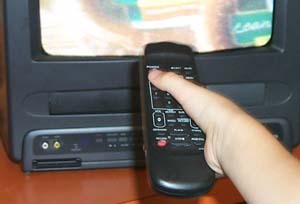 What does the Infrared show us? This is an infrared image of the Earth taken by the GOES 6 satellite in 1986. A scientist used temperatures to determine which parts of the image were from clouds and which were land and sea. Based on these temperature differences, he colored each separately using 256 colors, giving the image a realistic appearance. We know, from looking at an infrared image of a cat, that many things emit infrared light. But many things also reflect infrared light, particularly near infrared light. Near infrared radiation is not related to the temperature of the object being photographed - unless the object is very, very hot. Infrared film 'sees' the object because the Sun (or some other light source) shines infrared light on it and it is reflected or absorbed by the object. You could say that this reflecting or absorbing of infrared helps to determine the object's 'color' - its color being a combination of red, green, blue, and infrared! 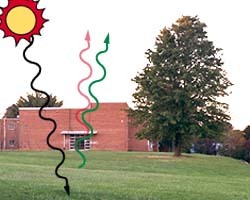 This image of a building with a tree and grass shows how Chlorophyll in plants reflect near infrared waves along with visible light waves. Even though we can't see the infrared waves, they are always there. The visible light waves drawn on this picture are green, and the infrared ones are pale red. This image was taken with special film that can detect invisible infrared waves. 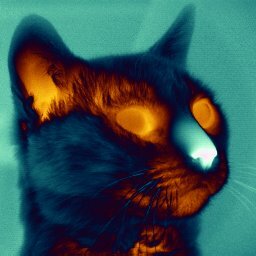 This is a false-color image, just like the one of the cat. 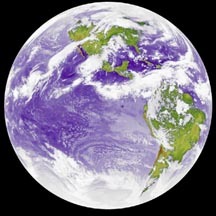 False-color infrared images of the Earth frequently use a color scheme like the one shown here, where infrared light is mapped to the visible color of red. This means that everything in this image that appears red is giving off or reflecting infrared light. 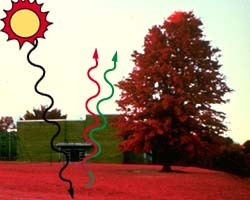 This makes vegetation like grasa and trees appear to be red. The visible light waves drawn on this picture are green, and the infrared ones are darker red. 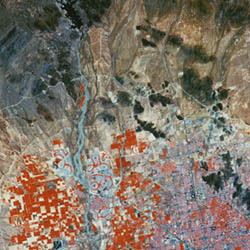 This is an image of Phoenix, Arizona showing the near infrared data collected by the Landsat 5 satellite. The light areas are areas with high reflectance of near infrared waves. The dark areas show little reflectance. 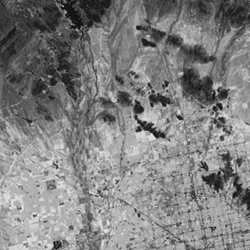 What do you think the black grid lines in the lower right of this image represent? This image shows the infrared data (appearing as red) composited with visible light data at the blue and green wavelengths. If near infrared is reflected off of healthy vegetation, what do you think the red square shaped areas are in the lower left of the image? Instruments on board satellites can also take pictures of things in space. 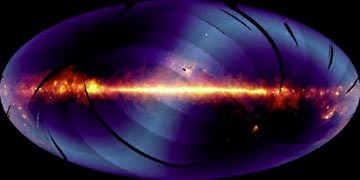 The image below of the center region of our galaxy was taken by IRAS. The hazy, horizontal S-shaped feature that crosses the image is faint heat emitted by dust in the plane of the Solar System.